I haven't done a capsule wardrobe since 2016. I have worked with a smaller number of items in my closet, but I haven't created an actual capsule in over a year. I have come back to the capsule wardrobe because it provides some great benefits. 1.) Outfits are easy to grab. My capsule is about half the size of my previous capsules and it has been wonderful. I actually think that I made my other capsules too big! It takes no time for me to get dressed. When our daughter was airlifted to the city, my husband was able to go in the plane with her. I drove up behind with Miss. Em. I stopped at the house to grab a few overnight items for all of us and my diaper bag. My capsule made it easy for me to quickly grab what I needed so that I could get on the road. 2.) It works for my life now. Let's be real. I don't have anything fancy to attend. I am a mom and I spend most of my days at home, running errands, going for walks and doing playschool drop off/pick up. I don't need to look particularly fashionable. I do want to look put together and I want my clothes to be practical. This wardrobe is really serving that purpose. It is functional, looks decent and allows access for nursing. 3.) Everything fits and works with my current body. I have set aside most of my pre-pregnancy clothes for the time being. My capsule only contains clothes that fit me right now. 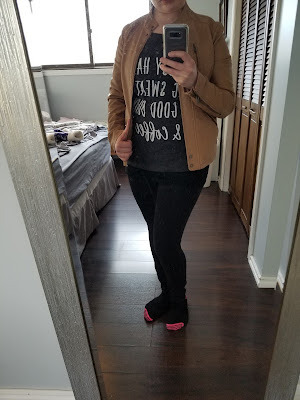 I was starting to feel down every time I got dressed because I would inevitably grab something that fit before I was pregnant. Of course, most of those clothes don't fit right now. Even the clothes that I can get on don't fit well. It helps to have a selection of clothes that I know are going to fit. There is no disappointment when I am getting ready, which is better for my self-confidence. 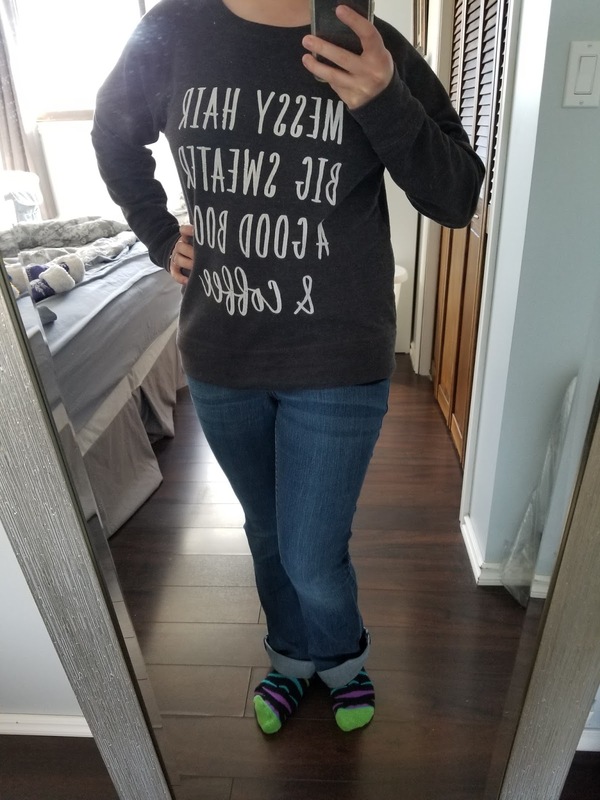 This sweatshirt has been on repeat lately. I love it because it is comfy and warm. I have a couple quick capsule wardrobe notes to share. -I wear nursing tank tops under my sweatshirts. I don't include them in my capsule total because I never wear them on their own. I truly treat them like underwear. -My capsule actually totals at 17 pieces. I have a long sleeve black nursing top that I forgot to include in the original count. 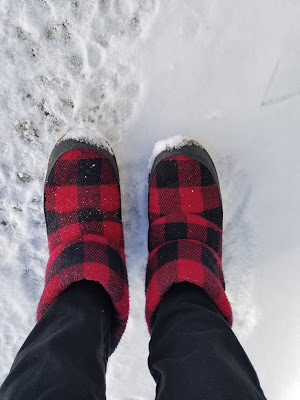 -I won't ever have shoes in these picture because I don't want my dirty winter boots in the inside of my house. My boots are super cute, though, so I am including a picture of them.